Shakespeare’s tragic play Othello, originally written in 1603, was set during the Venetian-Ottoman wars of the 15th and 16th centuries. In the current production at Pasadena’s A Noise Within, director Jessica Kubzansky has decided to set it in modern day Washington, D.C. Kubzansky lays out her reasoning in her “Director’s Note” in the program but little of it transfers to the stage. 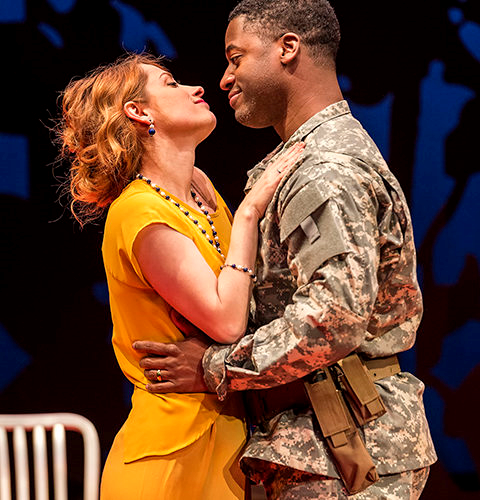 Even though the action is set in the army during wartime, Othello is a very small scale, personal play about jealousy, in love and in brotherhood. The setting is not that important; the emotional nuances are and Kubzansky has elicited very strong performances from her cast. Othello may be the title character, but the play and the bulk of the dialogue really belong to Iago. 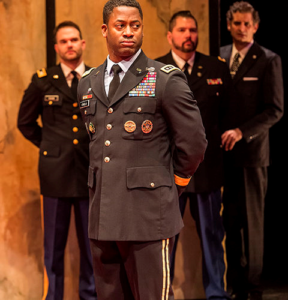 The two men have been comrades in arms through many campaigns; Iago the trusted ensign to Othello’s victorious general. When Othello gives a promotion to Cassio rather than to him, Iago goes off the rails and plots revenge against both men. 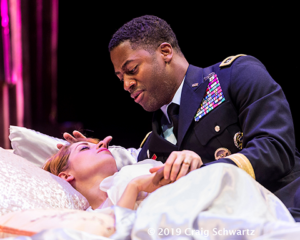 Othello has secretly married Desdemona, the daughter of an influential and racist Venetian senator. Iago intends to sow distrust and jealousy in this new marriage, regardless of the consequences. 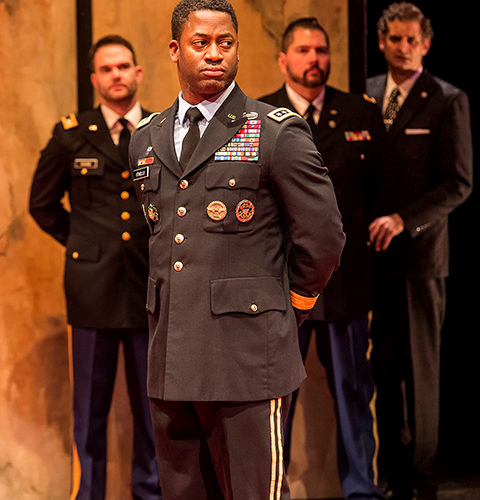 The more Othello and others call him “honest Iago”, the more lies Iago spreads among the company of bored soldiers. His hatred for Cassio and Othello soon goes from simmer to boiling until the stage is littered with bodies, much like the final scene of Shakespeare’s Hamlet. Michael Manuel commands the stage as Iago—think Kellyanne Conway or Sarah Sanders spewing their daily alternative facts, but with even more machismo and malice. Wayne T. Carr fills out Othello’s general’s uniform with style and he does seem to love his new wife, but is easily ensnared in Iago’s mendacities. Brian Henderson offers strong support as Cassio, an innocent caught up in the escalating personal warfare. Angela Gulner makes a lovely and loving Desdemona, confused by the mercurial moods of her new husband but unable to satisfy all his demands. 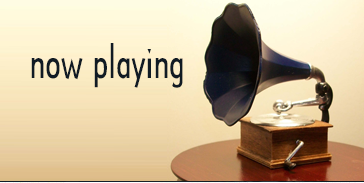 Most of Kubzansky’s moves to modern times don’t affect the play’s texture except for one glaring mistake. 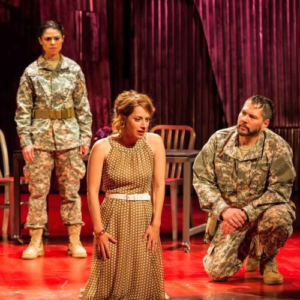 Emilia, Iago’s wife and Desdemona’s confidant, is made a soldier in her husband’s command. As hard as Tania Verafield tries, this military makeover does not make sense. One change that does work is the gender switch turning Desdemona’s racist father into a racist mother. Bonita Friedericy brings a heightened energy to a few of the play’s early scenes. Kenneth R. Merckx, Jr.’s fight choreography is suitably brutal.